One south sea cultured pearl, 10.0mm in size to 10.0mm in size. The pearl is dark golden in color with a good luster, near round to off round, mostly clean Graded in the setting. South Sea Cultured Pearls are farmed in the ocean waters throughout Australia, the Philippines, Indonesia, and the southern coast of China. Australia's main culturing industry is located near the city of Broome, in the northwest, on the Kimberley coast. South Sea cultured pearls form in the Pinctada Maxima oyster, the world's largest (up to 34cm) pearl cultivating oyster. The Indian & Pacific Ocean, the Java & the South China Sea, are the native waters of the Pinctada Maxima oyster. There are two varieties of the Pinctada Maxima: the Gold Lipped oyster which produces the golden color pearls, and the Silver Lipped oyster which produces white color pearls. 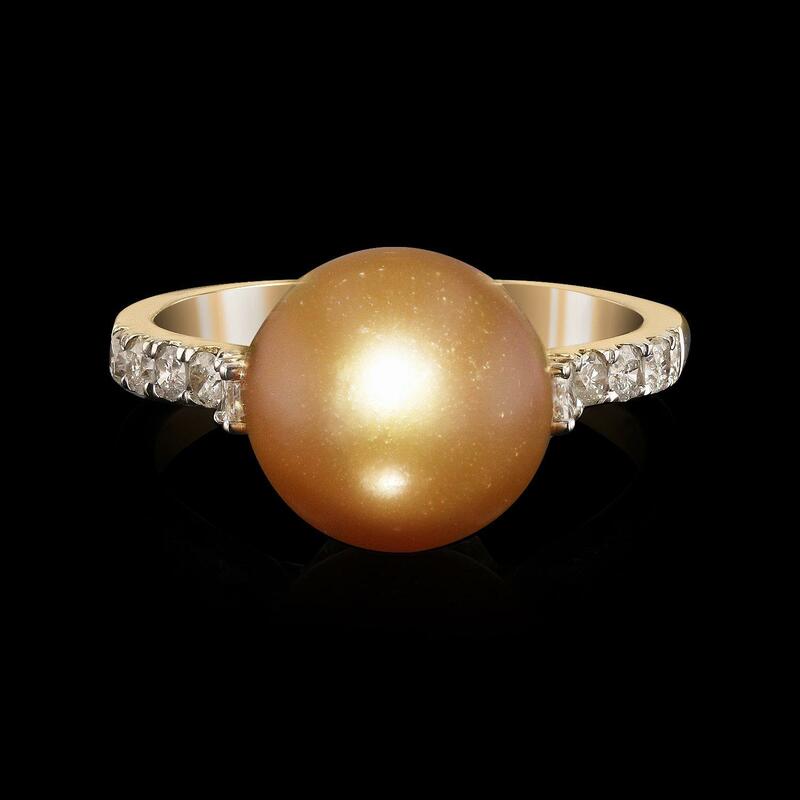 The South Sea cultured pearl takes from about two to three years to grow. It is produced by inserting a large bead into the oyster when it is about two years old. The South Sea pearl nacre has a unique satiny appearance, due partly to the fast moving and clean waters on the South Seas. Twenty prong set round and princess cut diamonds approximate total weight of 20 Stones = 0.65ct. Graded in the setting. Total Weight of Diamonds 0.65ctw.